“I want the world to know about him and I want to bury him. ... The ultimate injustice would be for him to be completely erased from history." Jimmy Francisco Ortiz Rodríguez, 28, grew up in El Salvador and never met his uncles Francisco Milton Romero Sequeira and Jorge Alberto Rodríguez Romero. He only heard portions of stories about them from his grandfather, Francisco Melitón Rodríguez Sequeira. But several years later, Ortiz Rodríguez put all the pieces together. On January 17, 1981, Francisco Milton, then 22, and Jorge Alberto, then 19, were watching TV with their family; they were all sitting together for the hugely popular Mexican show, "El Chavo del Ocho." The two brothers decided to go bathing in a nearby river, brushing away their father's admonitions to not go out because of the country's ongoing civil war. Later, “at around 4 o'clock in the afternoon a young man showed up and shouted to my grandfather that his sons had been captured,” recounted Ortiz. The two brothers are part of the estimated 5,000 who disappeared during the civil war, as government military forces battled rebels. It lasted from 1980 to 1992 and killed an estimated 75,000 people. 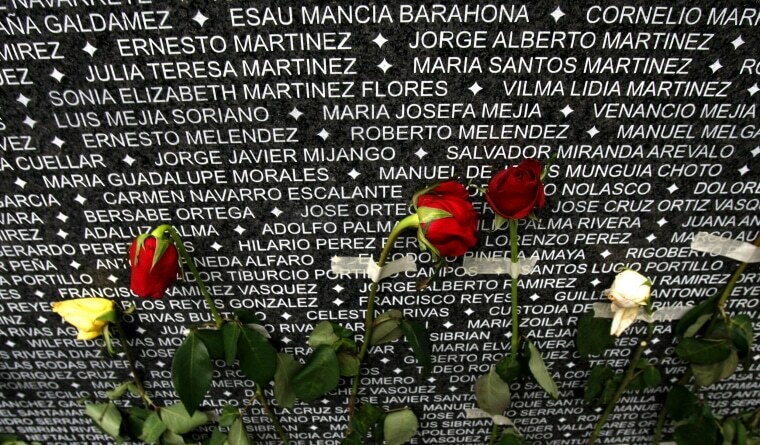 Now, more than 25 years after the war ended, Ortiz and others are still looking for their missing loved ones, trying to seek justice. On Friday, Conabusqueda opened its doors. It's the first governmental commission created to search for adults who disappeared during the conflict; it was created last September. Leonor Arteaga, senior program officer at the Due Process of Law Foundation in Washington, is a Salvadoran American who sits on the new commission. The three commissioners, who serve in voluntary positions, were appointed by El Salvador's president, Salvador Sánchez Cerén. Two of the commissioners, including Arteaga, were nominated by victims' and human rights 'organizations. Arteaga told NBC News one of the reasons Conabusqueda was created is because Salvadorans and Salvadoran Americans in the U.S. have been organizing, especially during the last three years, demanding answers from the government. One of those vocal voices in the U.S. is the Mauricio Aquino Foundation, which was co-founded by Alexandra Aquino-Fike, who was 18-months-old when her father, Mauricio Aquino Chacón, was forcibly abducted from his home in San Salvador at midnight on April 15, 1981. Aquino Chacón, a sales professional at a multinational corporation, was part of a multi-sector movement for social change, according to his family. Her father and others like him, Aquino-Fike told NBC News, were "thinking about how they could improve the society and the democratic conscience of the country to build a better El Salvador." Alexandra and her mother, co-founder Sylvia Rosales-Fike, eventually launched a campaign called Our Parents' Bones and sought answers from the U.S. and Salvadoran governments. The name for the campaign came to Aquino-Fike in a dream, which she described. The campaign gained support from several members of the U.S. house, including Reps. Jim McGovern, D-Mass., and Norma Torres, D-Calif., who sent a letter to the Obama administration in 2016 asking for the U.S. government to declassify U.S. records of the disappeared in El Salvador. But the search for the missing has existed for years, even during the Salvadoran civil war, by people like Jimmy’s grandfather who spoke to several people in the military right after they were disappeared in hopes of getting answers. “Look sir, don’t come here anymore. Your sons are not here, if you want to know where they are, it’s better you go to the volcano’s crater. Because that’s where they dump the dead bodies,” Ortiz said, recalling one of the responses his grandfather told him about. Jimmy’s grandfather continued to search for his sons for decades. Jimmy’s grandfather’s searched for his sons until he died in June 2014. His grandson picked up the torch and has continued to search for answers. “I promised him I would seek justice,” said Ortiz, who has filed a petition with the Inter American Court of Human Rights. He said the authorities in El Salvador weren't helpful when he sought to obtain answers. Salvadoran lawyer Jimmy OrtizCourtesy Jimmy Ortiz / Courtesy Reynaldo Leanos Jr.
Arteaga said the new governmental commission will also try to put pressure on the Salvadoran military to turn over documents related to forced disappearances that might help in their search for answers, but previous efforts by other groups have not been successful. One concern Arteaga has is over the commission's longevity, since it was created by a presidential decree. Ortiz is weary about the new commission because it took so long to create it. At the same time, he's also hopeful they will deliver on their promises, a sentiment he shares with Aquino-Fike, who hopes she’s made her dad proud.